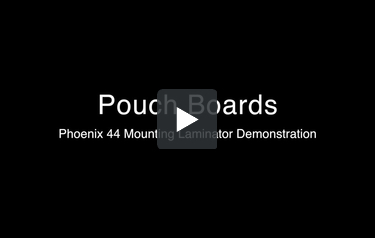 The 44" Phoenix is a professional grade, wide-format, mounting laminator designed initially to be used with pre-coated mounting boards, pouch boards and for the application of decal style laminated prints. However, this Phoenix laminator has also been equiped with a roll film kit that allows it to be used with 3" core roll film to help you achieve the look and feel that you require for your mounted documents. The roll film kit includes a of a roll film dispensing bar for films on a 3" core along with a brake tension and idler bar for film positioning. The robustly designed Phoenix laminator uses a metal frame construction with high quality 4" diameter silicone rollers for professional results. This laminator has two speeds and two temperature settings allow the Phoenix to work with a huge variety of medias and laminates. The Phoenix laminator includes 1 roll of 38" x 50' Gloss 5mil Digital Laminating Roll Film, 5 pieces of 25" x 37" Mounting Boards, and 5 pieces of 25" x 37" Gloss Pouch Boards to get the project started. Roll Film Kit: Consists of a roll film dispensing bar for 3" core films. Includes brake tension and idler bar for film positioning. Front panel doubles as a safety shield. Dimensions: 58" x 12" x 15"
This machine is awesome for pouch boards and simple mounting applications. We mostly use it with glossy finish boards because they are easy to use and look great. However, we have tried it with peel and stick mounting boards and it works great for those as well. We haven't tried it with any sort of laminating film. I think that might be a little bit difficult. The only downside to this machine is that it is way bigger than it looks in the pictures. Make sure you have enough space for it and consider getting a cart or a stand to put it on. Hello and welcome to the Phoenix video. 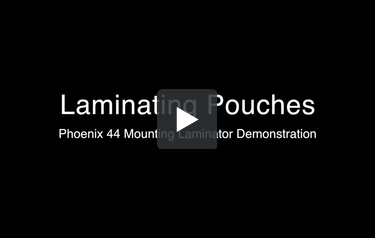 My name is Tricia Alberts and I’m here today to show you the new Phoenix Mounting and Laminating system. The Phoenix which is available in a 44 inch width is a tabletop touch laminator and is the easiest way to convert your prints into usable signs. This can more than double the value of your printing graphic. The Phoenix uses film punches to laminate prints to protect against moisture and wear and tear. Now, you’ve probably seen this on menus, blueprints, and even on the NFL sidelines where the coaches use them for those game plays, keeping them easy to read despite those demanding conditions. Patch boards are rigid mounting boards with lamination film attached. These adhere your prints to the boards and a protective lamination film in one easy step. You’ve seen these in retail stores on point of purchase displays, court room graphics, framed posters and short term signage. We manufacture a wide range of boards, including foam board for indoor use, plastic corrugated board for outdoor signage and these boards come available without lamination for our more economical user. We have video segments to show you the making of all of these products. So, let’s go ahead and get started and look at the Phoenix video. Before we start laminating with the Phoenix, let’s review the setup of the Phoenix Laminating system. The Phoenix is UL listed and requires a standard 120 volt, 20 amp grounded outlet. If you do not have a grounded outlet, contact your local electrician. To turn the Phoenix on, turn on the main power switch located on the back of the Laminator. All of the controls to run the Phoenix are in the panel and control nub. As we turn on the unit, we must now select either pouch or roll depending on your application. You can use the Phoenix cold to smooth prints and mount on heat sensitive materials, but today all out applications require heat. To turn the heat on, depress the appropriate heat switch. This will take about 20 minutes for your unit to heat up. The knob sets the gap between the top and the bottom rows inside the machine. While the Phoenix is heating up, set the gap to 0 so that the rolls are in contact. To do this, push the control knob and turn the knob to where the red arrow points to 0. This ensures the top row will be evenly heated. While the machine comes to temperature, let’s review the controls. The flashing light means that the heat is on and the rollers are heating up. When the light stops flashing, you’ll know that the machine is at temperature and you’re ready to go. The two speed setting range from 1 foot per minute to 1 foot every 2 minutes. The fastest speed should work with all pouch products and papers up to 7 mil thick. For thinner papers and films, try a slower speed. As a general rule of thumb, the fastest speed first. That’s it, you’ve seen how to turn on the machine, heat it up, control the thickness or the gaps between the rollers. That’s all you need to know to operate your Phoenix. So, while the machine is heating up, we’ll assemble some supplies and get ready to mount and laminate in our next segment. We are going to demonstrate how to use a patch board to make a upscale display where your print adheres to a board and the surface is coated with a laminate finish. The laminate finish both protects the print from moisture and handling as well as enhances the visual look. We offer non reflective matte as well as a high gloss finish. For this demonstration, we are going to use a high gloss patch board with our print. The board we are using as heat activated adhesive coated over the entire surface with a laminate film attached at the leading edge. What’s good about having the entire surface coated is that it allows you to trim into your print to create a plaque or a full bleeding edge effect with everything staying permanently together. The first thing we are going to do is place our print on the board. The heat activated adhesive on the board and the film is dry to the touch and this allows us to position our print exactly where we want on the board. The boards we are using are 3/16 of an inch thick, so before we can insert our board into the Phoenix, we’ll set the thickness or gaps in between our rolls to 3/16 of an inch on the control knob. Now we are ready to process our print in the Phoenix. To hold everything in place, hold the side of your mounting board with your thumb and forefinger and insert the board into the Phoenix, leading edge first. It takes a little pressure, but once the rolls begin to pull your print, you can let go and wait for the mounted print to exit the Phoenix. As the print exits the Phoenix, supporting the print can help minimise bowing. You can either stand and hold it or have a print exit onto a table. Once it comes out, it will be warm and you may want to let it cool for a minute. Now our print is professionally mounted. We can trim it, place it in a frame, punch holes to hang it by or put Velcro on the back, whatever you need to do to display your product. If you have and questions on how to display your prints, give us a call, we’ll be happy to help. We are going to demonstrate how to adhere a print to a mounting board. To accomplish this we are going to use a mounting board, a print and a non-stick cover sheet. The board we are using has heat activated adhesive coated over the entire surface. The great thing about heat activated adhesive is that it is dry to the touch and allows us to position our print exactly where we want it on the board. This is especially good when placing multiple prints on one board. The first thing we are going to do is place our print on the board. In this case, I’ll place it in the middle, although many times you may want to place it flush on one edge to minimise trimming. Then I’ll place a non-stick cover sheet over the print with the V-fold fitting around the leading edge of the board. The non-stick cover sheet keeps any adhesive which is not covered by our print from sticking to the rollers on the inside of the machine. As the print Exits the Phoenix, supporting the print can help minimise bowing. Once the print is out, it will be warm and you may want to let it cool for a minute. Remove the cover sheet and place it in a safe spot for the next mount. Now our print is professionally mounted and we can trim it, place it in a frame, punch holes to hang it or put Velcro on the back; whatever you need to do to display your product. If you need help with ideas for displaying your product, give us a call; we’ll be happy to help. The unique feature of the Phoenix mounting and laminating system is the ability to use a variety of roll lamination films. This allows you to laminate one or both sides of your print. To install the roll of lamination film, simply slide the roll onto the mandrill and use the supply tool to lock into place. The first step is to thread the film under the idler bar and then over the heated roller. Next, pull the film up to the leading edge of the film tray. Set the threading board on top of the film and then insert into the Phoenix, this pulls the film and the board in all at once, threading the laminator. Now we are ready to laminate a mounting board. Since the adhesive has not yet been activated, you can easily position the print to the board. Once the print is positioned, run the rest of the threading board through the laminator then immediately followed by your print. As the board goes through the Phoenix, it’s laminating the print and adhering it to the board in one easy step. As the threading board exits the rollers, cut it off and once the print is almost all the way through it, follow the threading board once again, this will keep the adhesive from coming into contact with the rollers. To single side laminate your prints, simply place your prints on a silicone coated board. The laminate will adhere to the prints but not the board. For two sided lamination, simply remove your print from the silicone coated board, flip it over and repeat the process. That’s it! It’s that easy. We’ve mounted, laminated, even two-sided laminated with one easy system, the Phoenix 44 inch mounting and laminating system. Do you want a laminator that's as versatile as they come? How about one that's compatible with both mounting boards and film? And one that can process large items? If so, you need to look at the Phoenix 44" Wide-Format Laminator. Here are its strengths, as well as a brief look at what could be improved. The Phoenix is a wide-format laminator that was designed to be used with items such as pre-coated mounting boards. (It's also compatible with pouch and gator boards, foamboard, etc.) The boards you use with it can be up to 1/4" thick so you'll be able to create professional-looking graphics and visual aids for a wide variety of uses. 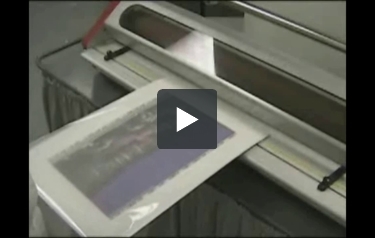 In addition to mounting products, this machine is compatible with laminating film. You need a special kit to prepare the device for film, but it comes pre-installed on the machine. The rolls you use can have 3" cores. Ideally, the film should be either 3 or 5 mil thick. This device has four rollers to ensure that everything you laminate will look terrific, whether it's a paper document or a mounting board. The Phoenix works pretty quickly and is capable of laminating a foot-long item in one minute. You'll be able to complete your work in no time when you use this device. Also, you'll stay safe while doing so because it has a safety shield to keep your hands away from the heating element. You can use pressure-sensitive film when laminating because the Phoenix has a cold setting. This will allow you to laminate ink-jet printouts, pictures, and more. This machine comes with a one-year warranty so you can have it repaired or even replaced if the need arises. You can order an optional cart, stand, or cutter with this device. The cutter will help you trim excess film while the stand and cart will enable you to store the machine in a convenient spot. If you need some supplies to get you started, you'll be pleased to know that the Phoenix comes with a starter kit. The kit contains a number of boards you can use right away and yo u don't have to shell out any extra money for them. As you would expect from a device that has a 43-inch laminating width, this device is pretty large. It's also heavy. The Phoenix's dimensions are 58" (width) x 12" (depth) x 15" (height) and it weighs 225 pounds. This machine only has two temperature settings: hot and cold. It also only has two speed settings: slow and fast. (The "slow" button has a turtle on it while the "fast" one shows a rabbit, so they're easy to identify.) Therefore, this product wouldn't be a good choice if you like to have total control over your laminating experience. The Phoenix is one of the most unique laminators you can currently buy. Very few of the devices on the market today are a versatile as this one, allowing you to use mounting boards, film, and other supplies. It's great that it has both hot and cold settings and that it comes with some supplies so you can begin laminating right away. So if you want a laminator that just about has it all, you'll want to give the Phoenix a try. Is this item still abvailable and will a newer model be introduce? Thank you for your question. The Phoenix 44" Wide Format Mounting Laminator is a machine that is still available at this point the manufacturer if/when a new model of this machine will be made available. I was wondering if you sell a cover for the laminators. Thank you for your question. Unfortunately a dust cover is not offered for the Phoenix 44". The only one offerered on our site is for a wide format 65" laminator. You can find that here. Interested in purchasing this Laminator but was asked if it is 508 compliant? I don't think it has to be but thought I'd ask. Also, is this machine available still? Thank you for your questions. The Phoenix 44" Wide Format Mounting Laminator is still a available machine. We contacted the manufacturer and it is not a certified 508 compliant machine. In discussing it with them they were not aware of any roll laminators that would carry that certification. Was wondering where to purchase a new heat element for our 44" Laminator model Ph44m? For parts, we would need to contact the manufacturer and get you a quote on cost and availability. To do that we would need the part number. Give our customer service department a call at 1-800-944-4573 and we can help you get the process started.